Somos+, Victor Manuel Camposeco, 10 September 2016 — In April of 1960m from the official newspapers Hoy (Today) and Revolución along with the leftist organization FIDEL, the demands to take by force the three independent print media still standing seemed unstoppable. For months, the newsrooms of those newspapers had also been infiltrated by State agents. Diario de la Marina, the most influential conservative newspaper in Cuba, respected by publishers and the publuc, which had at one time had supported Castro, had it own building in Havana, “a stately stone building,” at the corner of Paseo del Prado and Brasil Street. On May 11 it published a spread signed by more than 300 of its workers in support of defending freedom of expression. Members of FIDEL advised by the infiltrators, along with a huge crowd, took the building by assault the night before and its facilities were partly destroyed. The police refused to intervene. 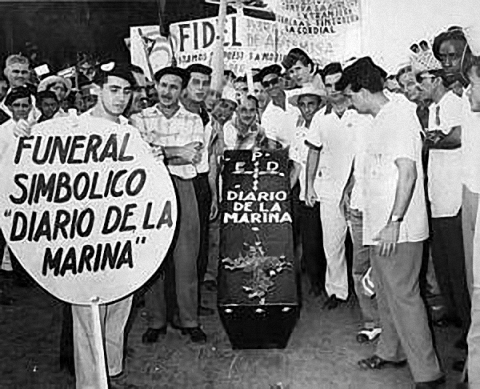 The next day, at the University of Havana, the already tamed the University Students Federation, FEU, led a grotesque celebration: between slapstick and jokes they buried a copy of the last Diario de la Marina published. Through the pages of Diario de la Marina had passed Pedro Henriquez Urena, Miguel Angel Asturias, Mariategui, Borges, Alejo Carpentier and Lezama Lima, among many others. Shortly afterwards the Rivero family, owners and managers of the newspaper, went into exile. The “stately stone building” was delivered with its workshops and offices, to the Communist newspaper Hoy . The life of Diario de la Marina, then celebrating its 128th year, was violently ended. 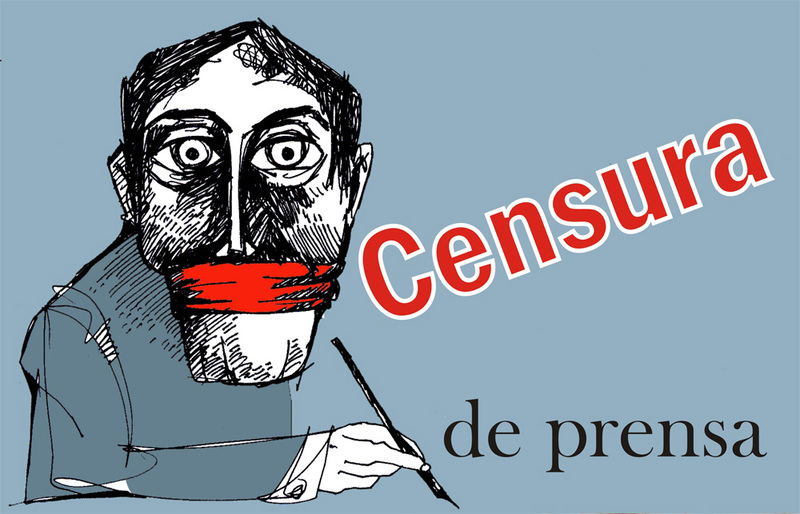 Humberto Medrano, deputy director of Prensa Libre, the largest newspaper in Cuba, published an article the next day: It is painful to witness the funeral of freedom of thought in a center dedicated to culture […] Because what was buried last night [at the University] was not a newspaper. Symbolically what was buried was freedom of thought and expression. The obligatory colophon of this act is the commentary in the periodical Revolutción. The title of this commentary says it all: “Prensa Libre on the road to La Marina.” They didn’t have to say it, everyone knows. On July 4, at night, the FIDEL mob took by assault the Prensa Libre facilities. Medrano left the building, the street teemed with activists. One of them tried to stop him, shouting comments for the occasion, but others stopped him. Medrano got into his car and went to seek asylum at the nearest embassy, that of Panama. Perhaps during the drive he recalled the six times Batista’s police had stopped him, before the triumph of the Revolution, and interrogated him for publishing comments that displeased that other dictator. Days later Humberto Medrano, escorted to the airport by the ambassador of Panama, left with his family on a commercial flight to Miami. That same week he got a job as a taxi driver. He soon began writing for a local newspaper and has devoted himself since that time to the fight for respect for human rights in Cuba. He is 85 years old. At the end of the fifties, the most important magazine in Latin America was Bohemia. Founded in 1908, it was directed by Miguel Angel Quevedo, the son of the founder. “Bohemia reported when reporting was dangerous,” said Humberto Medrano in 2008. The first interview Fidel Castro gave to a Cuban media, from the Sierra Maestra, went to Bohemia. The magazine sent Augustine Alles Soberon to interview Fidel and he also interviewed Che. The editorials, news reports, photographs and articles in favor of Fidel Castro, by Alles Soberon and later others, filled dozens of pages of the magazine. Fidel Castro himself published in Bohemia. Recently installed in power Fidel Castro visited the magazine’s offices. That was a party, about which a large and proud story was published in the weekly magazine itself. The courageous editorial attitude of Bohemia against Batista, in defense of freedom of expression and in support of Castro, was the most prominent among all the media. On June 15, 1960 Fidel Castro celebrated the Day of Freedom of the Press. A year after that party with Fidel in Bohemia’s offices, the crazed mob of the FIDEL organization took the workshops and offices of the magazine by assault. Miguel Angel Quevedo took refuge in the Embassy of Venezuela. He committed suicide in Caracas in 1969.